Klarien Klingen and Leonardo van den Berg set out to ride from Portugal to their home in the Netherlands. They spent two months riding from southern Portugal to the neighbourhood of Gueret in France. Unfortunately Klarien's horse became very slightly unsound at this point, so with great reluctance they decided to switch to bicycles while Klarien's very kind father took the horse back in a trailer. 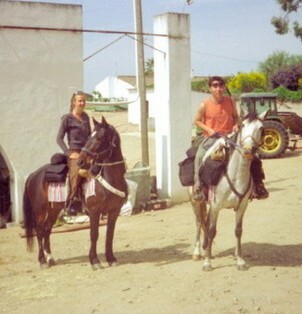 It took us two months to ride just over 1600 kilometers (from Montes Juntos in Portugal to la Chatre in France). From the centre of France we travelled 800 km to our home country the Netherlands by bike." These Long Riders had some interesting remarks on the different countries they rode through. In Spain, every village has somewhere for the horses to drink. Maps are hard to find, but old people can still remember the little back roads and tracks which existed before the days of the car. But the Long Riders invariably had to pay for grain. In France everybody loves horses, and drivers slow down when passing them. So many people had horses that it was always possible to obtain horse food. The French also have well-marked "Grand Randonné" routes which lead through beautiful countryside and keep riders away from the roads. And the French were very generous, almost never allowing Klarien to pay for feed. They were not in Portugal for very long, but it seems the people there were the friendliest of all, "people are very kind and the poorer they are, the more they want to give," Klarien explained.